BALTIMORE (CNS) — The accomplishment of winning the Super Bowl in February 2013 as the head coach of the Baltimore Ravens gave John Harbaugh a crowning achievement in football, but he relied on his Catholic faith to guide him and his players through a series of potentially spirit-crushing events during the past year. The worst was a nighttime phone call about a catastrophic off-season accident that caused severe head trauma to one of his promising young players, 23-year-old Tray Walker. The March 17 call caused Harbaugh a sleepless night but he reached out to his team the next morning before Walker died by writing an open letter that urged them to develop a spiritual life, to live with purpose and to consider the risks when making decisions. Harbaugh shared with his players that he viewed them as sons and wanted to offer guidance about how to live and to look after their loved ones. His deeply held religious beliefs had intensified during the past year as he prayed for the words to speak to his team during the 2015 football season when major injuries to key players led to a number of close losses as the perennial playoff-contending team had a 5-11 record. Johnny Shelton, the Ravens’ nondenominational team chaplain, witnessed Harbaugh “grow spiritually” during the season and said that his players responded to their coach’s messages as he sought to prepare them each week. In a society where political correctness causes leaders to shy away from acknowledging God’s role in their lives, Harbaugh humbled himself in giving passionate, Scripture-based locker room talks to keep his team focused on putting aside setbacks and seizing new opportunities, Shelton added. Harbaugh also participates in a weekly bible study with other coaches on the team that focuses on preparing them to be “leaders of men,” Shelton said. Those sessions give Harbaugh and his fellow Ravens coaches a spiritual foundation to guide their players through challenging circumstances. — Lead in your home. Take care of your family and yourself every single day. — Please consider your actions and choices. There are always consequences. Choose who you allow to advise you. Consider the quality of the counsel you take. Put yourself in positions to succeed. Turn away from unnecessary and risky behavior. — Be your own best friend. Do not be an enemy onto yourself. Turn away from trouble and harm. Walk away from foolish behavior. Ignore silly and unwise advice — you’ll know it when you see it. — Get to know those people in your life who manage to walk free from the weight of self-created obstacles. Get close to those who have gone where you want to go, and have accomplished what you want to accomplish. Grow spiritually. Think about what and who you want to become. Just 12 days before Walker’s accident, Harbaugh gave a talk to an estimated 1,300 men at the 19th annual Lenten retreat of the Catholic Men’s Fellowship of Maryland and told a record number of attendees that the faith-based way he lives his personal life also guides him in coaching his NFL team. Harbaugh tackled Baltimore’s difficult football season by turning to his religious beliefs in leading his players. In his keynote speech March 5 at St. Philip Neri Catholic Church in Linthicum, Harbaugh spoke about trying to be grateful for life’s blessings each day despite disappointments. His message of relying on faith to persevere through tumultuous times resonated with the men in attendance, said Ed Roberts, a member of the fellowship’s board of directors. “He wrote a speech and he clearly was able to bring a spiritual and personal side to the tough season the team had,” Roberts told Catholic News Service. That resolve is a tribute to Harbaugh’s “leadership abilities” as a man who is “sincere of heart” in pursuing God’s plan for his life, Roberts said. “The church was filled and we had guys sitting on the floor, and no one seemed to mind,” said Roberts, in explaining the worship space had only 1,200 seats for the 1,300 attendees. “It was probably one of the best events that I’ve ever attended,” Roberts said. Tony Boehk, president of the Catholic Men’s Fellowship, said one of Harbaugh’s most striking points was telling the group that assistant coach Craig Van Steeg also serves in an unofficial capacity as an “accountability coach” to ensure his head coach prepared spiritually, Boehk said. 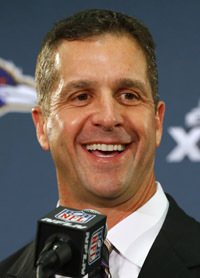 Van Steeg and Harbaugh previously were assistant football coaches together at the University of Cincinnati before they reunited with the Ravens in 2008. “He didn’t realize how uncomfortable God would make it,” Boehk told CNS. Father Christopher Whatley, the Ravens’ Catholic chaplain since Harbaugh joined the team in 2008 and the pastor of St. Mark in Catonsville, said Harbaugh regularly attends Mass the day of games along with about 20 Ravens coaches and players, including kicker Justin Tucker. Harbaugh’s parents, Jack and Jackie, are also Catholic and attend the team Mass when they are in town for a game, the priest said.